What do you remember most from visiting your mom or dad on the job? 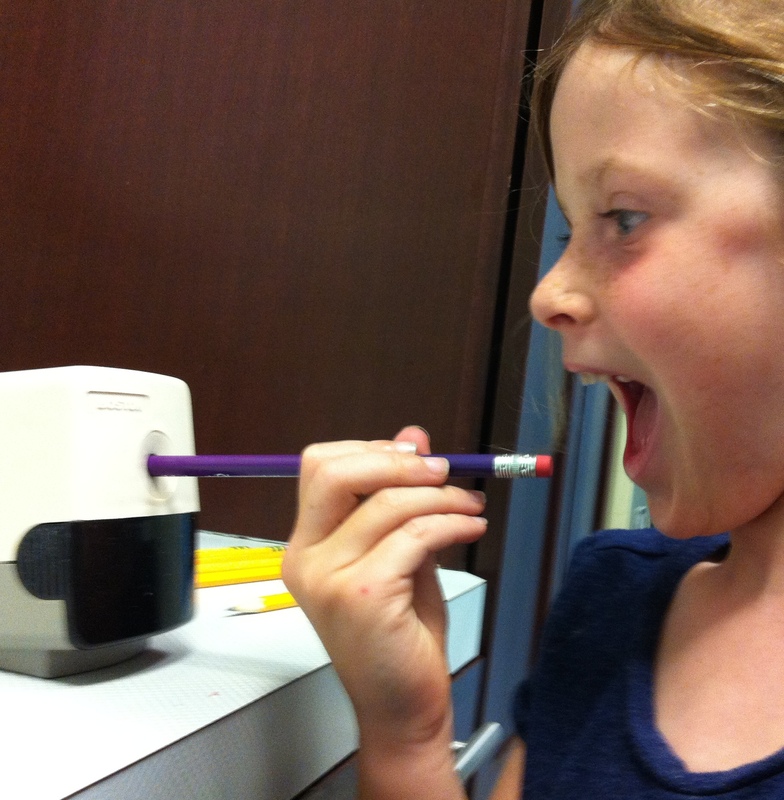 For example, my kids love the electric pencil sharpener at my office; they just can’t get enough of it. What do *you* remember noticing as a pint-sized workplace visitor? Below, in the order they came in (and edited only to string together follow-on posts or to fix typos) are the responses I received. Since many Work Stew readers aren’t on Facebook, I thought I’d share them here as well. To add a memory of your own, please email me at kate@workstew.com. I’m always happy to throw another tidbit into the Stew! Rebecca Kerr: The peppermint bowl! Navin Madras: The typewriters, a whole row of them. My mom worked as a stenographer at a company that manufactured sewing thread. The office was about a 15-minute walk from school. Oh, the joy of pounding the keys and hearing them clack, the ding of the carriage, that satisfying slide and stop when you return it. And to beat all those, rolling the spool of spent typrewriter-ribbon across the floor. Heather Walton Barnhart: My dad is a train dispatcher, and I could see rows and rows of these lines that represented the trains…that and the moveable keyboard and rolling chair! The lines were displayed on computer screens back in the DOS days…very cool as a kid when computers were new and exciting. They were different colors depending on what they were doing…red, white, and green. It was like Christmas! And they blinked. I’d say there were 20 or so screens, three rows high, several monitors-long wrapping around the desk. If I was lucky, I got to sit in the chair and roll side to side to watch them. It was neat. Bethany M. Allen: My dad worked for the forest service. During the summer, my siblings and I would nag him to take us along when he went to work, even though it meant leaving the house super early. We would spend most of the day riding all over the beautiful state of Maine in his big, green truck. I remember the dewy summer mornings, Italian sandwiches for lunch, and hanging my hand out the open window as we drove along. Emily Sato: The black ball point pens that said “U.S. Government” on the side. The dark green linoleum in the Department of Interior building. The huge rooms full of lab equipment making funny noises. Oh, and the moon rocks in plastic baggies. Trish Bittman: I loved helping my dad’s secretary file and I thought it was so cool my dad’s suite mate had a TV in his office. Chad Barker: The photocopier. They owned their own company together so I felt entitled (when have I not?!) to put whatever items I wanted onto that glass. I also loved going into the office supply closet. Justin Ausmeier: The “flight chair” and little spit bowl next to the flight chair in my dad’s dental office. The drills were cool too! Marcy Porus-Gottlieb: The dictaphone in my dad’s doctors office. He used it to dictate patient notes—my sister and I sang into it! Melissa Rich: The Norman Rockwell paintings in my dad’s office—and lots and lots of stacks of papers! I now have the Rockwell prints and also have stacks and stacks of papers. The more things change, the more they stay the same. Christine de Brabander: The very cold room where they kept the computer. And, that there was a bicycle out in the warehouse/plant area that was for getting around quickly. My dad worked at a Chrysler plant, in the office section of the parts depot. He was also a UAW officer there, so the really *magical* thing wasn’t in his office, it was that when he went on a business trip to Detroit, he brought back this little bag of salted peanuts from the plane. Lisa Maguire: My father was a Freudian psychoanalyst, so we could only go to his office when it was empty. Sometimes we went to the office to clean it on weekends. I noticed that he doodled in the margins of his notepads (he eventually stopped taking notes—when did they all stop doing that?). We liked to play on his couch. Dana Sweany-Schumacher: I remember walking into the embassy lobby and seeing the marine security guards on duty in the guard box, wearing their dress blues. I also remember my dad sweeping his desk clear into his top drawer as soon as he sighted us. I always thought it was top secret papers he was hiding. I did not realize, until I was a teenager, that it was his cigarettes and ashtray. Turns out my dad was a chain smoker at work until he quit around the time I headed to college. However, I never saw him smoke a single cigarette my whole life. He did not want my sisters and me to know he smoked or to think it was okay. Michael T Heath: My mother worked for AT&T, so we didn’t get in as kids. Dad was service manager for Buick, and I recall making a fishing pole out of a car antenna and ‘fishing’ in a barrel of old motor oil from a stairway in the shop. Lindsay Moran: My dad worked for the David Taylor Naval Research and Development Center where there was a ginormous (very dimly lit) towing tank that seemed dangerously easy to fall into and never be seen again. Also, he worked in a cubicle-sized safe, and his secretary answered the phone with, “This in an insecure line.” My mother worked at University of Maryland’s office of readmissions and had three hot male undergrads as her assistants. I could walk by myself across the green to The Dairy—for the University of Maryland’s world famous homemade ice cream. Roger Pitcher: My Dad worked at an Engineering company. We would drive over in the evenings to pick him up in our ’56 Dodge (with fins). We would wait out front, our car parked next to the Chairman’s limousine. The driver, who wore a uniform, would open the back door and let me and my sister look in. It was the first time I ever encountered an air-conditioned automobile. I remember it was very, very cold. Aaron M Berntson: My Dad was a teacher and taught shop for a few years. I remember coming in on the weekends while he worked on one or another projects and playing chase with my dog between all of the shop benches that were set up checker board style. The smell of sawdust was in the air. Pam Older: My dad was a dentist and I learned about making jewelry using dental wax and tools from him. I was always very crafty so that was a revelation and I loved to work in his lab and make simple rings. I never thought about this before but this was a precursor to my becoming a jewelry designer! Meesh Joslyn Pierce: My Dad was a radio producer for the likes of Casey Kasem’s American Top 40, King Biscuit Flower Hour, and other shows broadcast around the world on Armed Forces Radio. I remember the smell of the studio and the 2′-3′ strips of reel-to-reel tape my Dad had on the inside of his metal storage locker that were expletives he’d spliced out of the recording sessions! Nina Slotkin Fortmeyer: I rarely went to my father’s office in NYC, but I liked the copy machine. Not much there for a kid. Amy Hillgren Peterson: Until I was in third grade, if elementary schools had a day off but upper schools did not (hence both my parents worked while I was out of school) I would accompany my dad to a junior high school of about 300 enrolled, where he, the principal, and the secretary were the only office employees. I remember the hallways. I’d accompany kids on study hall (who thought I was so cute) to deliver notes from the office, sit on a stool and observe in shop class, eat lunch with a table of seventh grade girls (some of whom I knew well as they babysat me on the occasional Saturday night), and generally occupy this netherworld of young ruler. I did not have nearly the status when I really was in junior high, unfortunately. Tuck Pescosolido: I have fond memories of computers controlled by punch cards, a Pepsi machine that only charged 10 cents, and a warehouse filled with crates of motor oil. Kate Geis: From my Mom, being allowed to help pass meal trays in the galley kitchen to her flight attendant colleagues on a Pan Am flight to Mexico (the world 20 years before 9/11). At 10-years-old being a flight attendant seemed really fun. And from my Dad, he was a USIA public affairs officer, which involved everything from overseeing a library to hosting authors like Susan Sontag. Consulates, government offices, have a particular sterile smell that I love but at the same time remind me of childhood boredom waiting for him to finish work so we could do something more fun. Krista Brockwood: My dad—recently retired—was a teacher, so going to school was also going to work with him. I couldn’t cross my eyes without it getting back to him. I do remember that he would oversee Saturday School (think Breakfast Club but way more boring) and I’d go with him sometimes. I’d try and figure out what everyone did wrong to get there. Not surprisingly, I was a bit of a goodie-two-shoes…until I wasn’t. Kate Gace Walton coaxes pearls out of hermit crabs with these beautiful childhood memories. We are all transported back decades to the wonderment, exploration (and, from decades later, perspective) the authors loan out in snippets. We are a varied bunch of souls, us writers. Thanks, Michael! And thanks, Mee, for adding your wonderful memories. This weekend, I will get them into the main post.